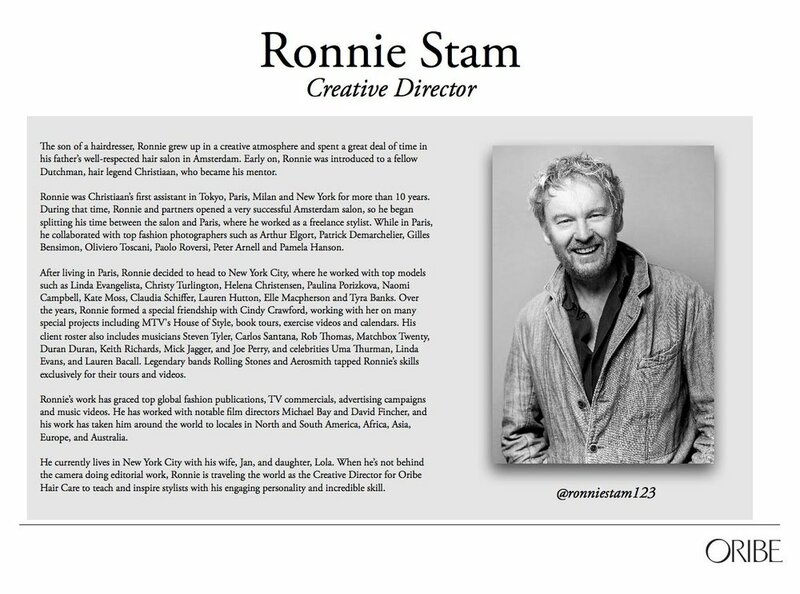 Ronnie Stam is one the top editorial artist in the industry. His work has graced the top global fashion magazines, music videos, TV commercials, and advertising campaigns. Ronnie was Christiaan's first assistant in Tokyo, Paris, Milan, and New York. In New York City he has worked with top models and fashion icons: Cindy Crawford, Linda Evangelista, Christy Turlington, Helen Christensen, Paulina Porizkowa, Naomi Campbell, Kate Moss, Claudia Schiffer, Lauren Hutton, Elle Macpherson and Tyra Banks. Who Wants An Amazing Haircut? Dan Nguyen, National Educator for Oribe Hair Care will be teaching the Oribe Signature Haircut at Umbrella Salon on Tuesday 07/18/17. Haircut is complimentary and you'll receive select Oribe Hair Care products. Interested? Please text us at (408) 293-4242. Coby, who is known as the hairdresser’s hairdresser, used Oribe’s vision as inspiration in order to help cultivate innovative cutting techniques that are widely used today. Umbrella Salon is currently pre-casting for creative color and cut hair models for the 2016 Wella TrendVision competition! This is an absolute hair color and hair cut model transformation commitment. Amazing prizes for stylist and models! Represent Umbrella Salon at North American Trendvision Awards in Las Vegas. All expenses paid. Represent the U.S. at the International TrendVision Award in Spain. All expenses paid. No extensions or hair pieces. Interested in being a Trendvision model for Umbrella Salon? Please complete the pre-casting form to set-up a consultation with a stylist. By checking confirmed, I understand that if selected as a Trendvision model for Umbrella Salon there will be an absolute transformation to my hair color and hair cut. PRE-CASTING MODEL CALL | UMBRELLA WELCOMES CELEBRITY JOEY GEORGE!!! Thank you for your interest. We will reply to your submission shortly. Oribe Hair Care is seeking 5 hair cut models for a live demonstration at Umbrella Salon this Wednesday, September 09/17/14 at 9:00AM. Models will receive a complimentary hair cut service and will be paid $100 for time and travel to the salon. Please complete form below if you're interested?